These are some of our good friends. Let us introduce you. John Finkelde is the founder of GrowAHealthyChurch.com where he provides resources, content, and wisdom to pastors online. John is a credentialed C3 Church pastor with 30 years pastoral leadership experience. He pastored from 1982 – 2012 and built a regional, multi-generational, healthy church that has impacted its local community through innovative programs and multiplied itself through church planting. His church planted 6 churches in the last 18 years and has 67% of their adults in small groups. John and Di became have conducted over 70 on site church consults and coached pastors across 10 different denominations. 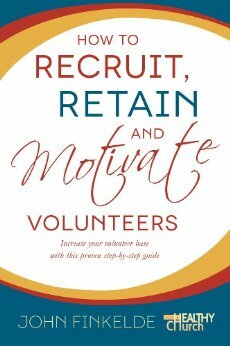 John has written several ebooks, including one on recruiting and retaining volunteers. Get a copy today on Amazon! Karl Vaters is the pastor of Cornerstone Christian Fellowship in Fountain Valley, CA. Karl is a small church pastor with a big heart and a bigger vision for healthy local churches. Karl and his wife Shelley have two sons and a daughter: Phil, Matt, and Veronica. Karl is the founder of NewSmallChurch and writes at "Pivot" for Christianity Today, a blog that champions small churches and small church pastors. Karl says bigger is not better, healthy is better! Karl writes and speaks to help small church pastors lead healthy small churches. Or, as Karl puts it - "Encouraging, Connecting, & Equipping Innovative Small Church Leaders"
Karl is a frequent guest on the podcast and has written a book called The Grasshopper Myth - Big Churches, Small Churches and the Small Thinking That Divides Us. If you haven't already, we would encourage you to get your copy today! Dave Jacobs is a full time coach to pastors, specializing with pastors of small churches. Dave is a cheerleader of small church pastors! He spends his days on his sprawling spread in southern Oregon, on the phone and the computer, coaching pastors regarding life, soul-care, ministry, and leadership. Dave and his wife Ellen have five adult children and eight grandchildren... too numerous and awesome to name them all! Dave planted and pastored churches for almost thirty years before founding SmallChurchPastor.com, where he coaches and counsels pastors. Dave also has a very active Facebook group, full of over 600 small church pastors, as well as his blog at DaveJacobs.net. Dave joins us on the podcast to help us encourage and inspire pastors of small churches. He has written the book Mile Wide Inch Deep - Experiencing God Beyond the Shallows: Soul Care For Busy Pastors and the Rest of Us. Grab one now!